As winter approaches, gradually lower the mowing height of your mower. A good rule of thumb is a grass height of two to two and a half inches. Too long and it will mat down on itself and be more prone to snow mold and contribute to thatch build up. Stick with the “rule of thirds,” which means not removing more than one third of the plant at a time, cutting too much off the top will leave grass overly stressed going into winter. The best time to apply fertilizer is when grass is done growing for the season, but still green. A “winterizer” fertilizer that has just two or three percentage points of nitrogen and potassium by weight will prevent excess amounts from leaching. You don’t want to encourage new growth when soil is close to freezing. This will increase the likelihood of snow mold and ice damage. This is also a good time to apply a thin layer (quarter inch or less) of compost as a top-dressing. 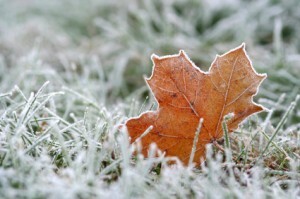 Try to aerate your lawn before the first frost. For heavy/compacted thatch, aerate twice a year – spring and fall. Thatch will only get worse with the affects of winter. A good aeration will set the stage for bountiful spring growth. Clear your lawn of debris (i.e. leaves, logs, toys, or gardening equipment). Once snow comes, these objects can smother your grass, damage your turf, and leave your lawn more vulnerable to diseases. Any seed applied in the fall should be perennial or annual ryegrass. Other species take too long to germinate and probably won’t make it before the end of the season (contrary to popular belief, what doesn’t germinate now will not come up in the spring). If you’ve had a dry fall you can and should water deeply once a week right up until the ground freezes. Dig down six to eight inches and feel the soil. If it’s moist, it doesn’t need water. Hydrating you lawn in the fall will facilitate healthy growth in the spring.